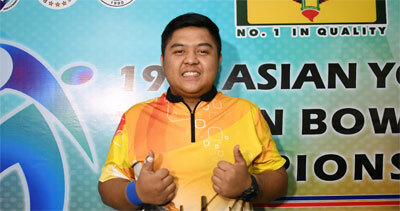 27th October, Manila: Doubles silver medallist, Billy Muhammad Islam of Indonesia and Team silver medallist, Faten Najihah of Malaysia topped the first block Masters finals of the 19th Asian Youth Tenpin Bowling Championships on Friday. Paolo M. Hernandez of Indonesia beat team-mate Islam in the opening match, 235-225 to take an early lead as Team gold medallist, Lee Ju Hung of Korea and sole Australian finalist, Blayne Fletcher both won their first match with 229 to share second spot. Lee won his second match to move into the lead while Islam, who also won his second match, took up second spot. A second Korean, Park Geon Ha moved up to third with Fletcher and Hernandez slipping down to third and fourth positions. A second win by Islam with 241 in the third match propelled him into the lead. Lee suffered a lowly 177 to drop down to third but his compatriot, Park won with 216 to take over second spot. Hernandez and Fletcher remained in fourth and fifth. The Indonesian leader was on a hot streak winning his next four matches with 242, 231, 214 and 204 to build up a massive 106-pin lead after seven matches. Lee recovered to trail in second most of the way while others were battling over third, fourth and fifth spots. Despite not winning the eighth match and suffering a low 163, Islam ended the first block in the lead with 1824 from six wins, still with a comfortable margin of 79 pins. Lee settled for second with 1745 from five wins while Fletcher finished strongly to clinch third position with 1734. Chinese Taipei's Liao Li-Yang quietly sneeked up into fourth position with 1703 from four wins while Park rounded out the top five with 1677, winning five matches. Meanwhile, the battle for top spot was between Malaysia's Faten Najihah and Korea's Lee Jung Min for most part of the first block. Team gold medallist and 2016 World Youth Masters silver medallist, Amabel Chua of Singapore took an early lead after winning her first two matches. But the Singaporean trailed new leader, Lee after the third match. A bigger win in the fourth match by Faten, saw the Malaysian taking over the lead and moving 17 pins pins ahead of the Korean. Faten held the lead despite not winning her fifth match. Lee won her sixth match with 237 to move into the lead. Faten bounced back with two wins of 233 and 224 in the seventh and eighth matches to end the block as leader with 1750, from six wins and a draw. A second Korean and Singles gold medallist, Kim Ye Sol edged her compatriot by 16 pins to take up second spot with 1722, just with four wins. Lee settled for third spot with 1706 from six wins. 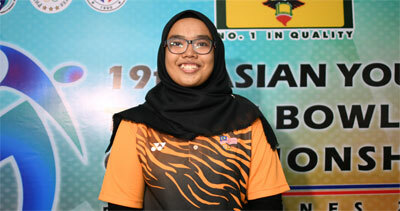 Early pace-setter, Chua finished fourth with 1681 from three wins and a draw while Singles and Team silver medallist, Nur Amirah Auni completed the top five with 1678. The finalists will resume with their second block of seven round-robin matches tomorrow. A position-round match will be played to determine the top 3 boys and top 3 girls advancing to the Stepladder Grand Finals.